A few days ago, I was filling my gas tank when I happened to look up at the pump. The ad displayed there intrigued me on several different levels. I'm happy to say that I found it far more inspiring than the "Simplify Your Life" campaign which they aired in 2010. I loved the mosaic gas can filled with images that begged to be examined. 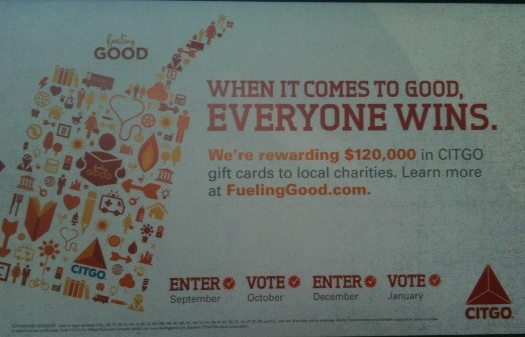 Its call to action was simple ... visit FuelingGood.com. When I did, I learned that Citgo has donated thousands of gallons of gas to charitable organizations. 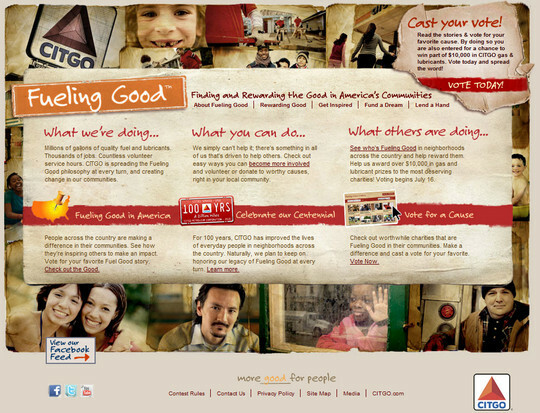 What a great gift-in-kind donation for nonprofit organizations who are trying to trim their operating costs. Research study after research study demonstrates that consumers are increasingly turning towards companies that deliver quality products and are good corporate citizens. But, here's the $6 million question ... will this ad encourage consumers to buy their gas at Citgo? In my own personal case, my unequivocal answer is yes. I like the idea of feeling good when fueling up.